October 31, 1935 – The Chicago Daily Tribune reports that the eight bridges between Michigan Avenue and Franklin Street have opened more times in a nine-month period than they have opened in most twelve-month years. According to Harbormaster William J. Lynch in the first nine months of 1935 the bridges opened 9,320 times between January 1 and September 30 with the average time a bridge stood open a bit less than four minutes. It is hard to imagine a situation today in which traffic in the center of the city is completely stopped over two dozen times a day as bridges are raised and lowered. According to Lynch these eight bridges blocked traffic a total of 546 hours – more than 68 eight-hour days – in the first nine months of the year. If one looks at all sixteen bridges that cross the river on the north and west side of the Loop, the number of openings came to 15,088 with motorists and pedestrians spending a total of 866 hours waiting for the bridges to do their work. At the south end of the North Branch of the river the little Kinzie Street bridge was opened 2,424 times in the first nine months of the year. Alderman William A. Rowan, the chairman of the council committee on harbors, wharves and bridges, reacts to the figures, saying, “The question involved is the convenience of millions of individuals as opposed to the convenience of a relatively few owners of vessels.” [Chicago Daily Tribune, October 31, 1935] He estimated that over 70 per cent of the openings of the eight bridges on the main stem of the river occurred to accommodate noncommercial vessels. 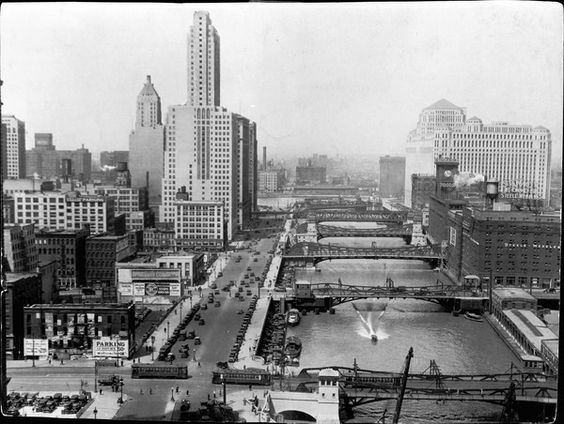 The above photo shows the main stem of the river in 1930, looking west from State Street, with the four-year-old Wacker Drive on its south side.